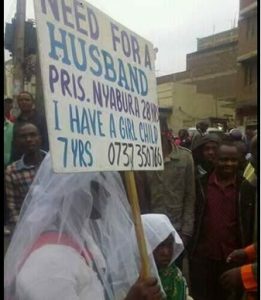 A Kenyan woman has taken the search for a husband to new levels after she went around Nairobi carrying a placard advertising for a husband. 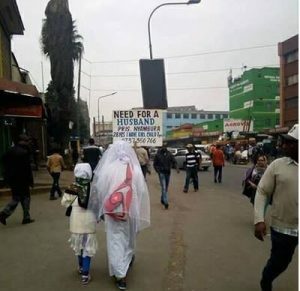 The woman, 28, was pictured wearing a wedding gown carrying a placard with the text, “Need for a husband Pris. Nyambura 28 years. I have a girl child”. Reports speculated that Nyambura feared she might not get a husband hence the advert for a husband. Nyambura asked prospective suitors to reach her on mobile number 0737 350766 but to the surprise of suitors who dialled the number, the line was busy. Some people frowned at her exposing her seven-year-old child to such an act.